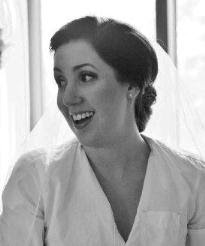 I'm still on the Mad Men premiere. Stop reading if you didn't watch. Could you believe the end with the other lady? I mean, I'm not surprised... it is Don after all. Did anyone else notice that every character, except Don, changed their look? Can Don change with the times? Can he modernize? I suppose we shall see. 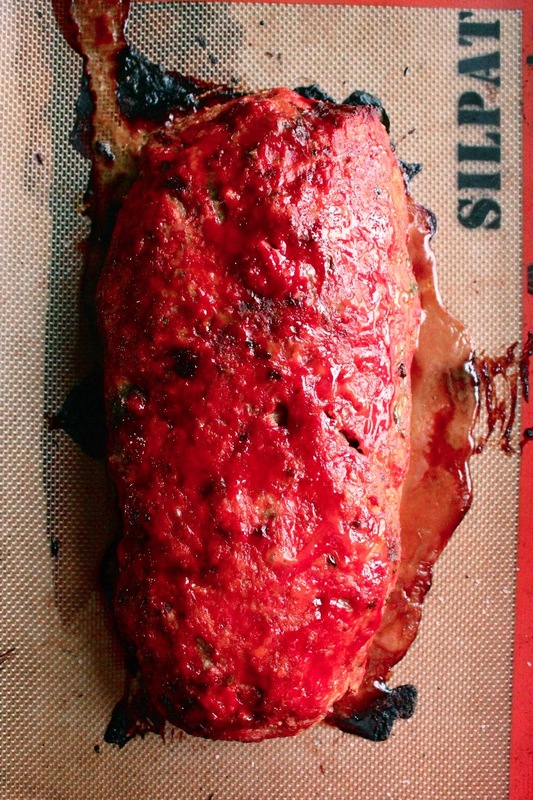 In the spirit of the era, I decided to make a good 'ole meatloaf. Seems like Betty or poor, ignorant Trudy would approve. To make things a bit leaner, I went with turkey and a flavorful chicken sausage. Caramelized onions modernized the whole thing and gave it that extra somethin' somethin'. 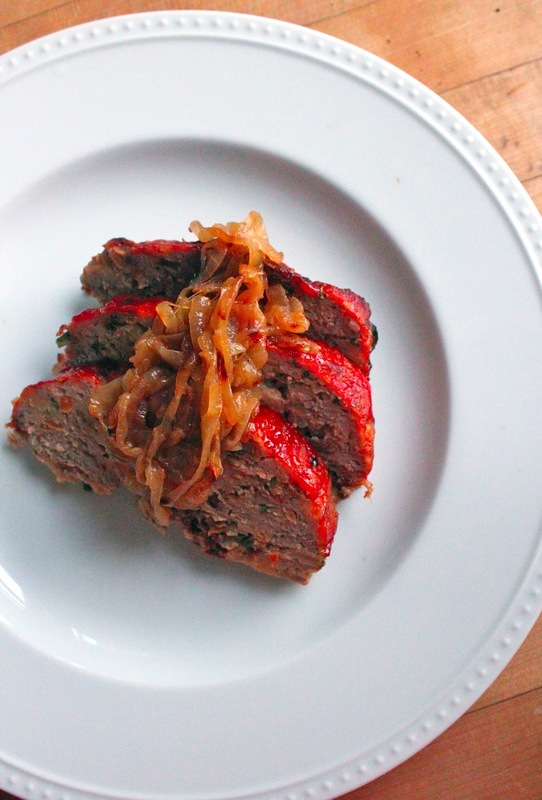 Meatloaf is traditionally a mix of beef, pork and veal. Turkey is a easy substitute in dishes like this, but you need to be careful to amp up the flavor and add a bit of fat, to keep the meatloaf from being dry and bland. I picked up these tomato basil chicken sausages from Trader Joe's and they were the perfect complement to the turkey. Italian sausage would be great here too, just look for something with a robust flavor. You'll also need to remove the sausage from its casing. Milk and breadcrumbs in the loaf will help it hold together and ensure that its moist. Get your hands dirty on this one. Its super important to mix with your hands and to do it gently. Toss just until combined and don't overdo it. Form into a loaf on lined and rimmed cookie sheet. I do a freeform loaf because it allows three sides to get gooey, rather than just the top. It will also allow any extra liquids to drain away, keeping the loaf from getting soggy. I don't own one of these... that would be ridiculous. I do keep things traditional with ketchup on top. It just feels so right. While that loaf is cooking away, start on the caramelized onions. It seems crazy, but these will take an hour or more. 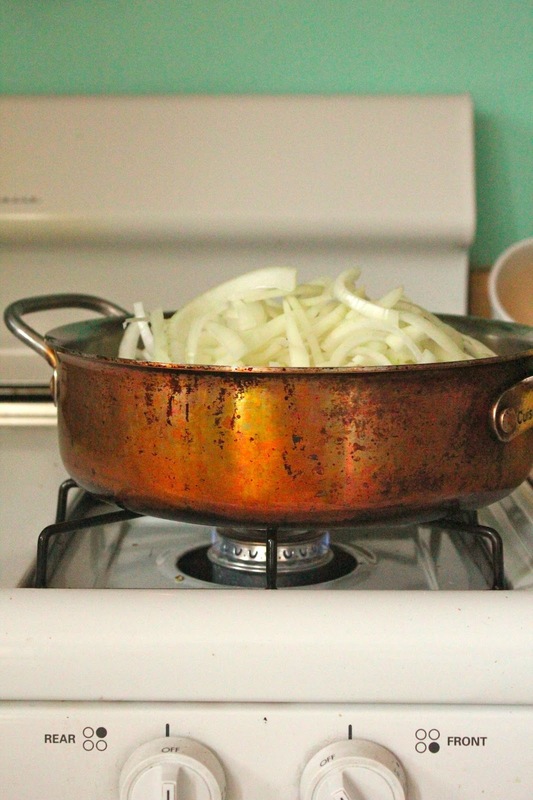 By cooking at a very low temperature, you draw out all of the natural sugar in the onions. They'll reduce like crazy too. There she is! See how much liquid drained away? That would be a soggy mess if you did this in a loaf pan. Preheat oven to 350 degrees. In a medium sized pan, heat 1 tablespoon of olive oil over medium-high heat. Add onions and carrots and saute until softened; about 5-6 minutes. When onions turn translucent add garlic and cook for another minute. Remove from heat and allow to cool completely. 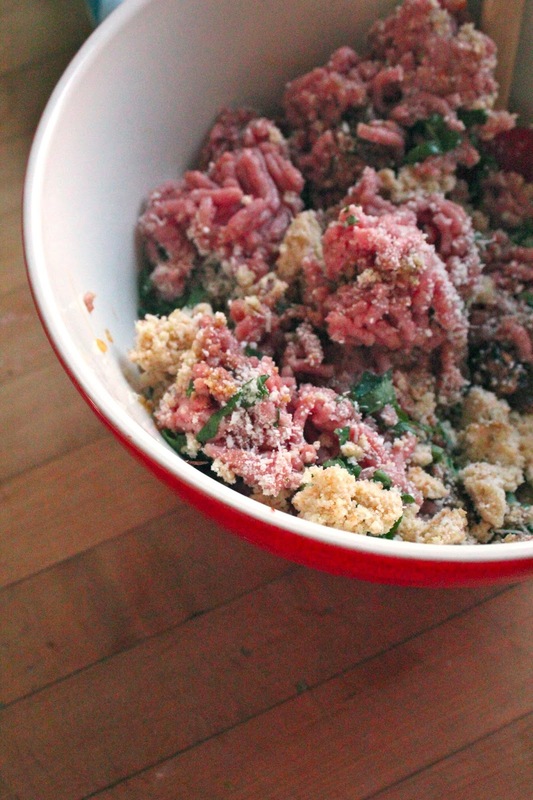 Remove casings from chicken sausages and crumble into a large bowl. Combine with turkey, onion mixture, egg, milk, bread crumbs, parmesan, basil, salt, pepper and Worcestershire. Combine ingredients gently using your hands, just until mixed. Do not overmix the meat. In your largest pan, heat remaining olive oil over low heat. Add sliced onions, tossing in oil. Reduce heat to lowest setting and cook onions for at least one hour; stirring frequently until they develop a caramel color. 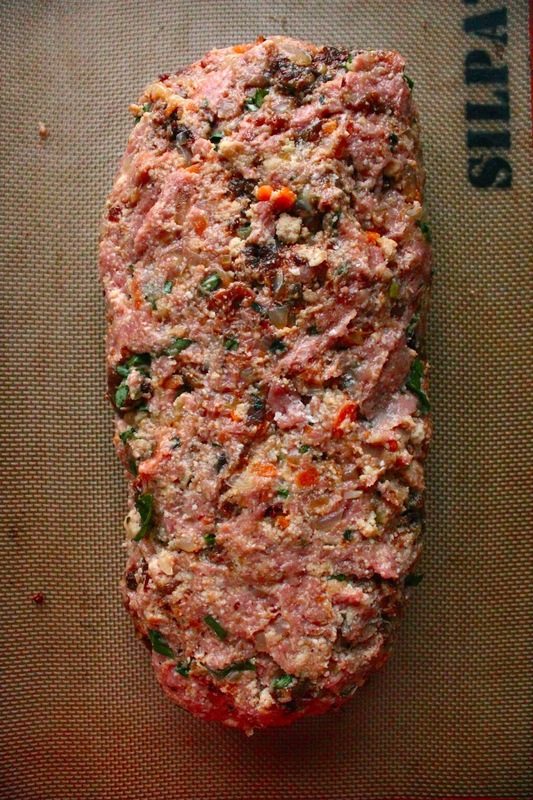 On a foil or Silpat lined cookie sheet, form meat mixture into a rectangular loaf. 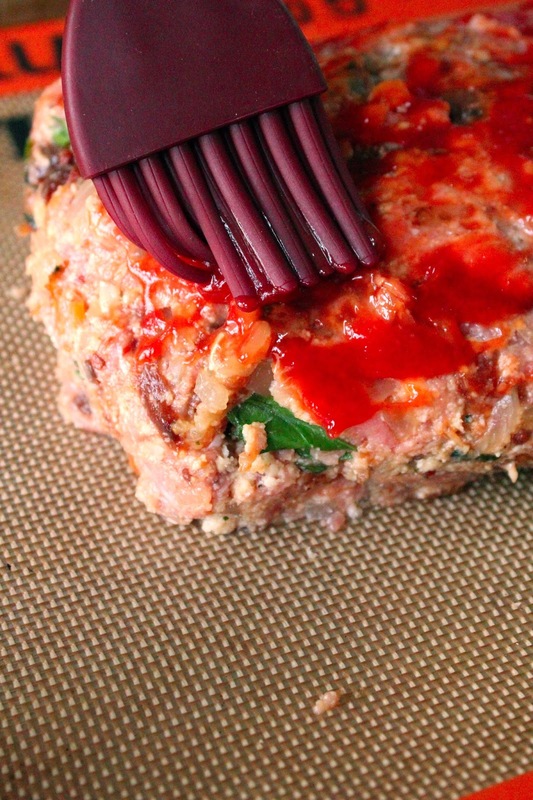 Brush 1/4 cup of the ketchup over the top and sides of the meatloaf. Cook for 1 1/2 hours, brushing with remaining ketchup halfway through. Cook until the inside reaches 160 degrees. Allow to cool for at least 15 minutes before slicing and serving.